Georges Clairin (1843–1919), Bust of a Woman in Profile (1899), further details not known. Wikimedia Commons. We seem to know remarkably little about Georges Jules Victor Clairin (1843-1919), although in his day he was a popular and successful artist. His surviving work is puzzling, in that it spans almost every genre and style, from almost illustrative depictions of society women in the late eighteenth century, to piles of dead men and camels in the North African desert. He was born in Paris, and was first trained in the studios of Isidore Pils and François-Édouard Picot, before going on to the École des Beaux-arts in Paris in 1861. After that, he accompanied the great history painter Henri Regnault to Spain, and Jean-Léon Gérôme to Italy. He went on to Morocco, where he made friends with Marià Fortuny. In 1895, he accompanied the great composer Camille Saint-Saëns to Egypt. Georges Clairin (1843–1919), The King’s Fool (1880), further details not known. Wikimedia Commons. Clairin had a reputation of being a socialite, and the first group of his paintings are in keeping with that. 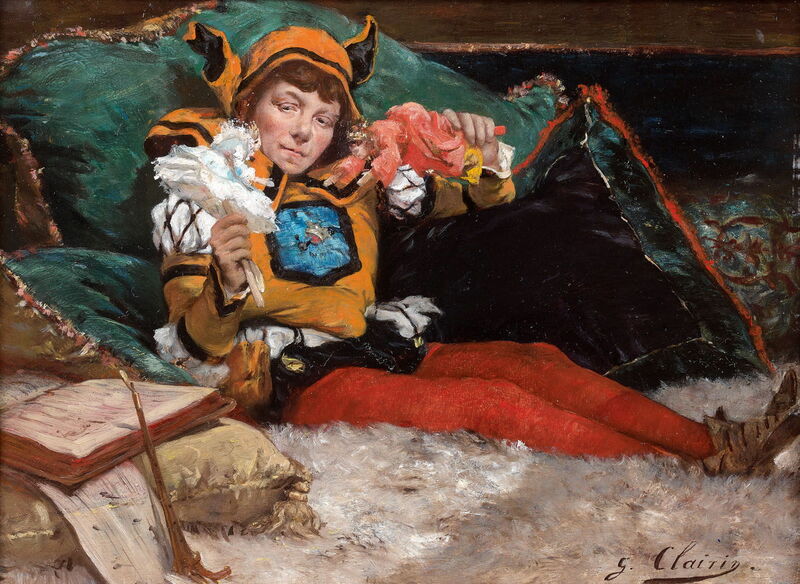 The King’s Fool (1880) shows a court jester: great fun, wonderful textures, but not exactly deep or meaningful art. 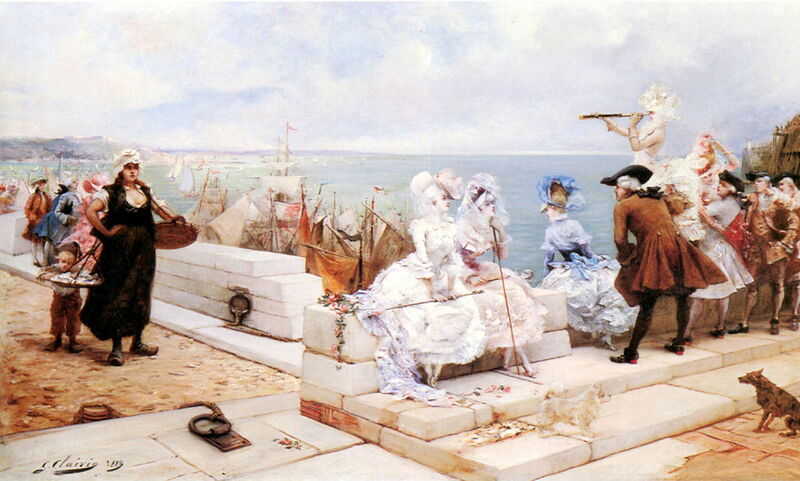 Georges Clairin (1843–1919), Elegant Figures Watching the Regatta (1889), oil on canvas, 132.1 × 79.4 cm, location not known. Wikimedia Commons. Many of these paintings, like Elegant Figures Watching the Regatta (1889), are, judging by the fashions shown, set in 1780s. Although there are glimpses of some apparently interesting characters, such as the woman and child on the left, this is really all frills and giggles. 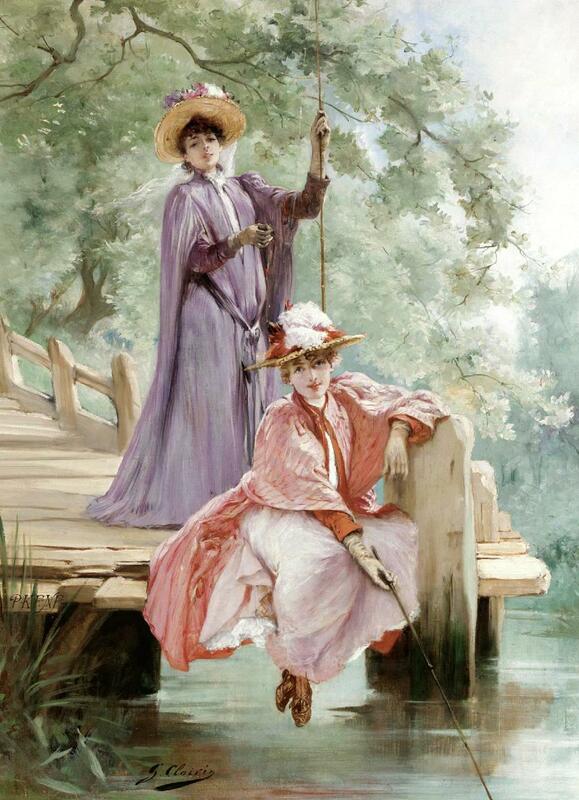 Georges Clairin (1843–1919), Elegant Ladies Fishing (date not known), further details not known. Wikimedia Commons. Change the date, change the fashions, and a couple of the elegant ladies who were watching that regatta become Elegant Ladies Fishing (date not known). Georges Clairin (1843–1919), Elegant Couple at the Coast (date not known), oil on canvas, 65 x 54 cm, location not known. Wikimedia Commons. Clairin here takes them off to walk in the fresh breeze by the sea, in Elegant Couple at the Coast. Georges Clairin (1843–1919), Spanish Woman on Balcony (date not known), further details not known. Wikimedia Commons. 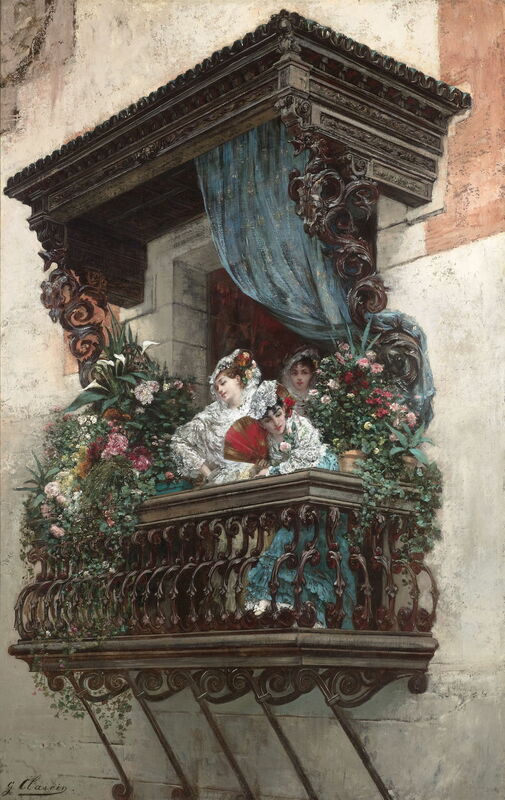 We also see this elegance abroad, in Clairin’s Spanish Woman on Balcony (date not known). 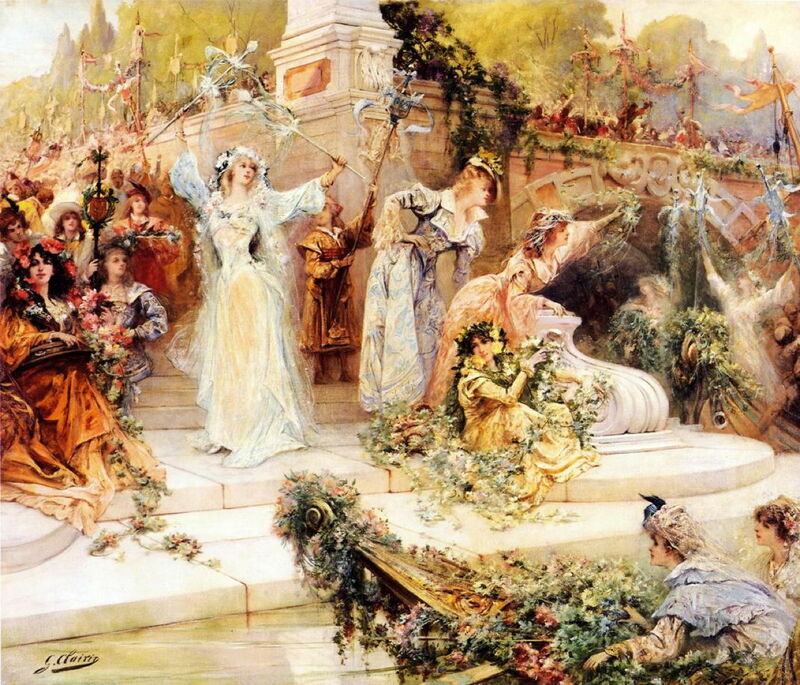 Georges Clairin (1843–1919), La Fete (The Celebration) (date not known), oil on canvas, 96.5 × 114.3 cm, Private collection. Wikimedia Commons. In La Fete, he borrows liberally from a multiplicity of different historical periods – classical marble, mediaeval, and rather later dress, I fancy. Georges Clairin (1843–1919), On the Balcony (c 1910), oil on canvas, 110.8 × 94.9 cm, location not known. Wikimedia Commons. 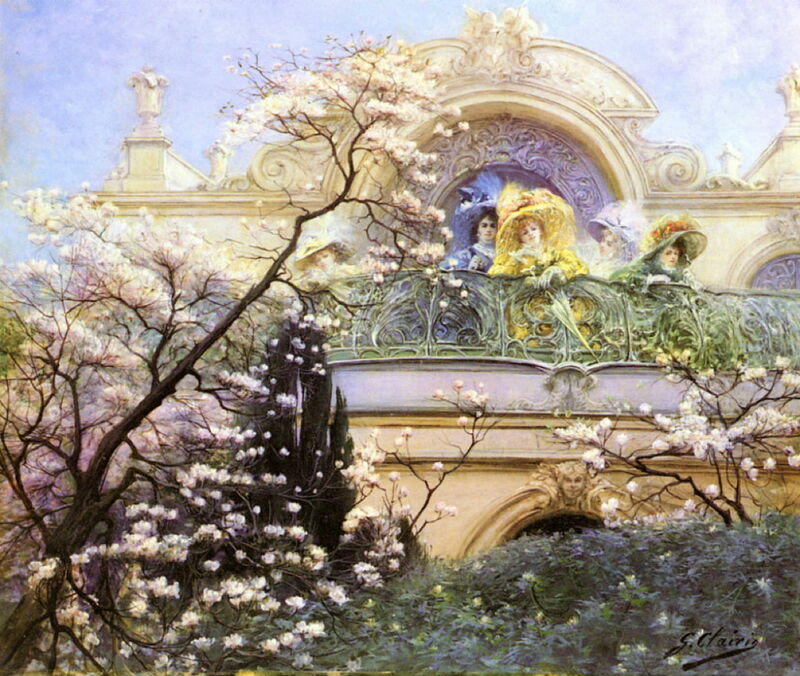 One of his later paintings from about 1910 brings an elegant group out among the lush blossoms On the Balcony. But just as you’re getting ready to dismiss these late nineteenth century follies, Clairin surprises. Georges Clairin (1843–1919), The Great Wave (1898), further details not known. Wikimedia Commons. The Great Wave (1898) was shown at the Salon in Paris that year. I apologise for this monochrome image of it, as I have been unable to locate any more recent colour version. With a title that reminds us of Hokusai’s print, Clairin shows us a sea nymph of some sort standing at the foot of a wave which towers beyond the top of his canvas. 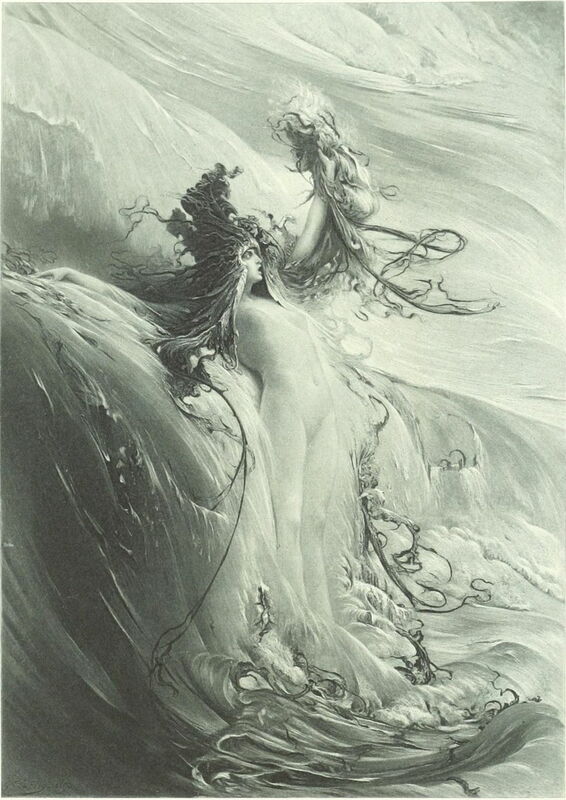 She is shouting, bellowing her command, and holding her left hand high, clutching a blend of hair and seaweed. Then from the following year, Clairin offers us this extraordinary Bust of a Woman in Profile (1899). 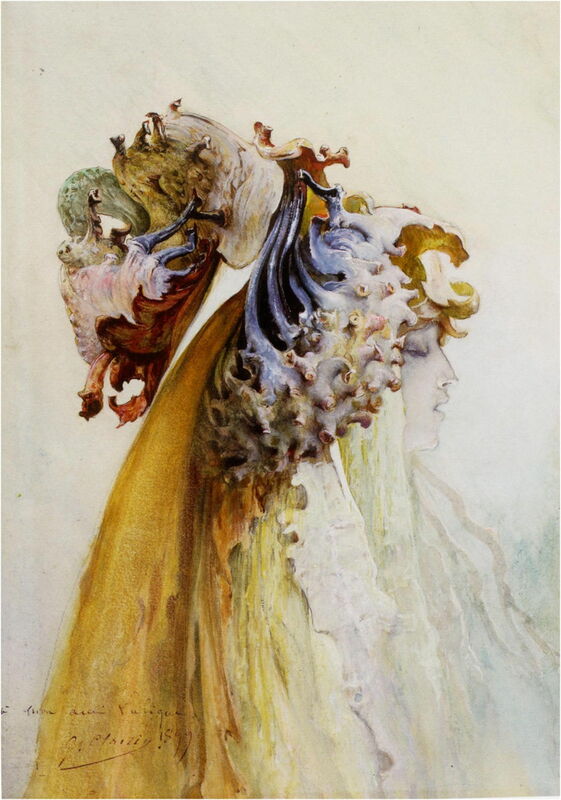 Perhaps another sea-nymph, she is wearing the most bizarre headgear which appears to have grown from coral. It has peculiar pedicles which sweep over her hair, and excrescences which look like the bodies of fabulous birds. Georges Clairin (1843–1919), The Goddess Neith (date not known), oil on canvas, 139.5 x 96.5 cm, Private collection. The Athenaeum. 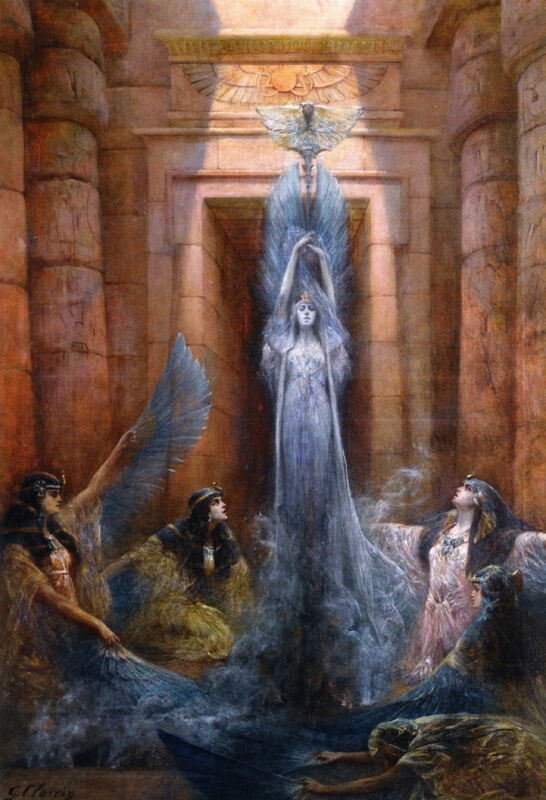 I think Clairin’s undated painting of The Goddess Neith was made in response to his visit to Egypt: Neith was said by the ancient Egyptians to have been the first and prime creator: “I am the things that are, that will be, and that have been”. As far as I can tell, his image is original, and not derived from any well-known source. If those seem a little too fanciful, Clairin also documented his time. Georges Clairin (1843–1919), Kelp-burning at the Pointe du Raz (1882), oil on canvas, 132 x 240 cm, Musée d’art et d’histoire, Saint-Brieuc, France. Wikimedia Commons. His painting of Kelp-burning at the Pointe du Raz (1882) shows Breton women working in arduous conditions at the far western tip of mainland France, hauling seaweed up from the beach, and burning it as a product, perhaps to be applied as fertiliser, or consumed by distant industry. Clairin seems to have taken a liking to Brittany, later in life spending his summers on Belle-Île, a remote and quite popular haunt of artists, including Claude Monet. Georges Clairin (1843–1919), Napoleon’s Troops in Front of San Marco, Venice (date not known), oil on canvas, dimensions and location not known. The Athenaeum. 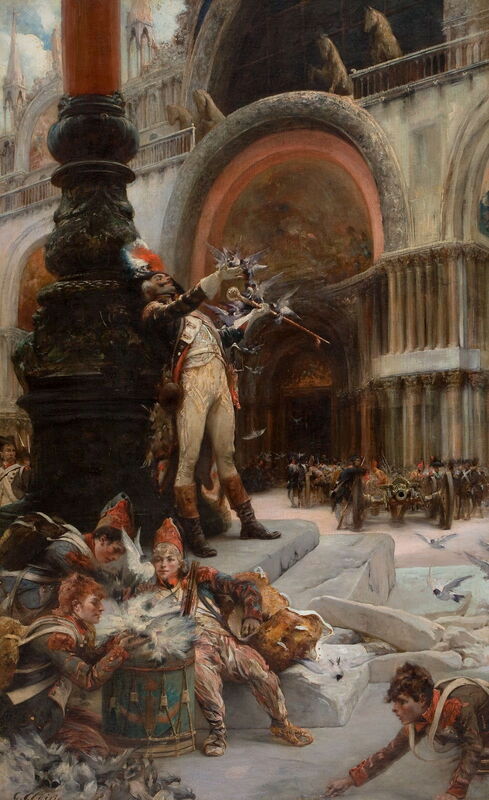 His painting of Napoleon’s Troops in Front of San Marco, Venice gives a rather biased gloss on the fall of the Venetian Republic to Napoleon Bonaparte in 1797. The French occupation around 4 June may itself have been relatively peaceful, but by the end of July had been declared a siege, with the arrest and imprisonment of many Venetians. Later in the year, the French plundered the city of many of its artworks, something that Clairin seems to have overlooked. His paintings of war were also something else. Georges Clairin (1843–1919), Carnage (1890), oil on canvas, 150.2 x 110.2 cm, Princeton University Art Museum, Princeton, NJ. Wikimedia Commons. Carnage (1890) appears to have been based on his experience in Morocco, following the war with Spain in 1859. Against a night sky lit by distant fires, Arabs are fighting from behind dead horses and camels. A large cavalry charge is taking place in the middle distance, the horses galloping from left to right, behind a white and a black horse, with their apocalyptic associations. 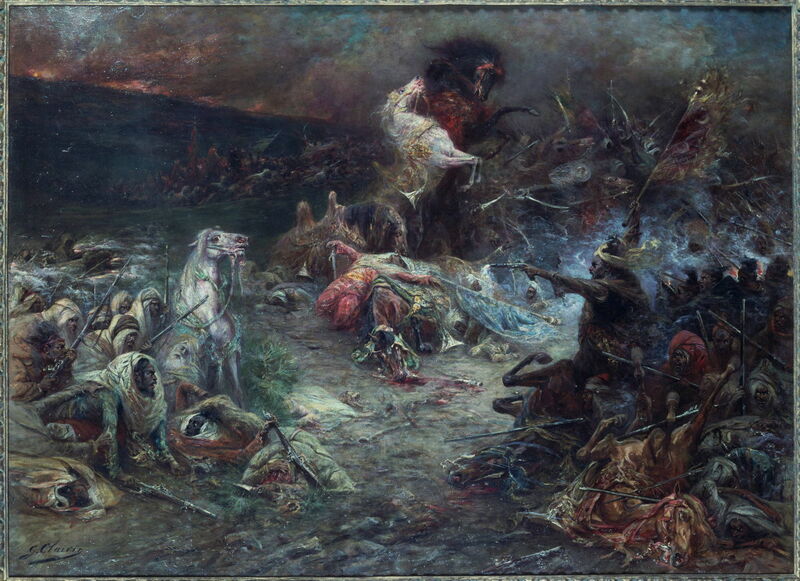 Georges Clairin (1843–1919), The Living Defend Their Dead. War of the Vendée (date not known), media and dimensions not known, Musée d’art et d’histoire de Cholet, Cholet, France. Wikimedia Commons. 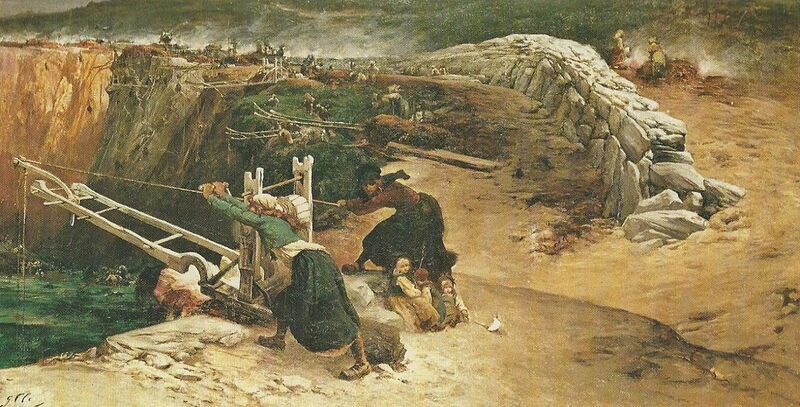 Clairin’s undated painting of The Living Defend Their Dead. War in the Vendée shows a scene from a suppressed and still little-known royalist uprising in the Vendée region of France, in the west, to the south of the River Loire, from 1793 onwards. 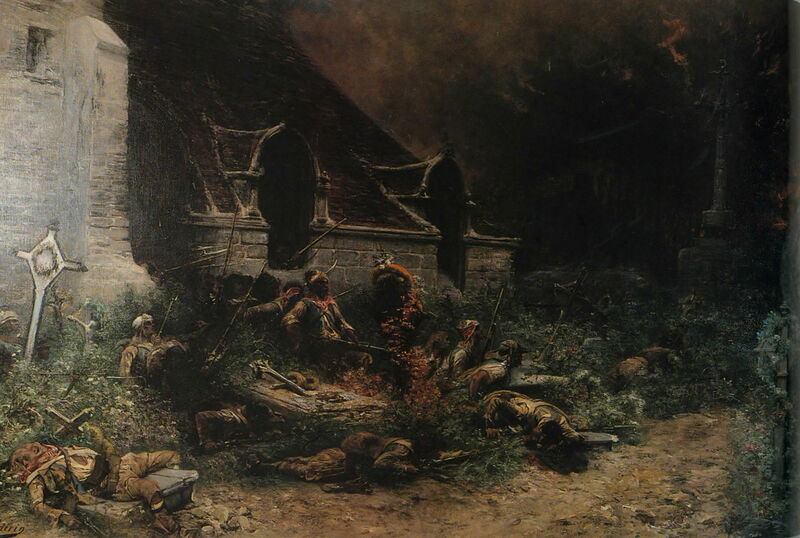 A small group of French rebels is taking shelter in the graveyard of a country church, on the lookout for the enemy. I have already discussed Clairin’s two beautiful paintings of Ouled Naïl women from the Atlas Mountains in North Africa, shown below. Georges Clairin (1843–1919), An Ouled Naïl Woman (date not known), further details not known. Wikimedia Commons. 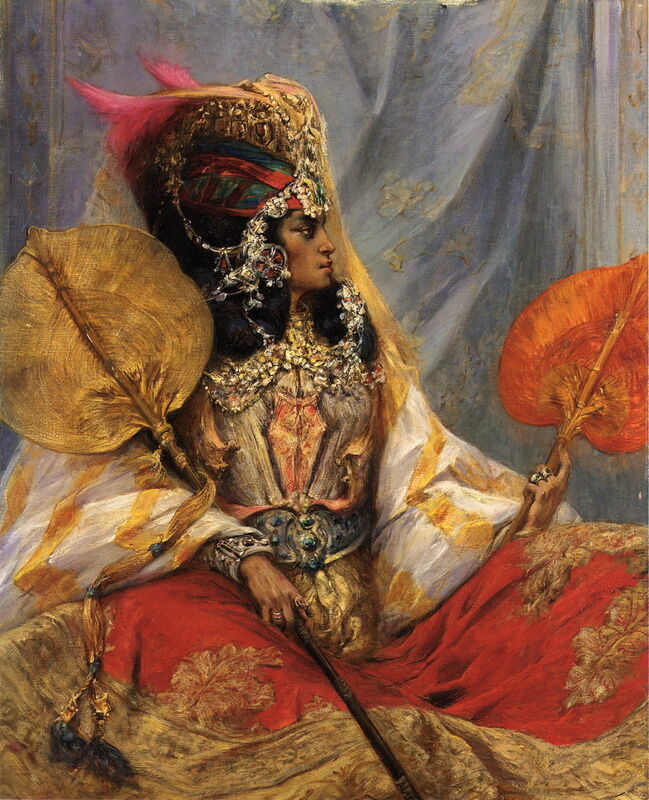 Georges Clairin (1843–1919), An Ouled-Naïl Tribal Dancer (1895), further details not known. Wikimedia Commons. Clairin’s fascination with costume and clothing was a common thread through his eclectic and diverse range of paintings. It also helped make him a friendship which lasted for fifty years. 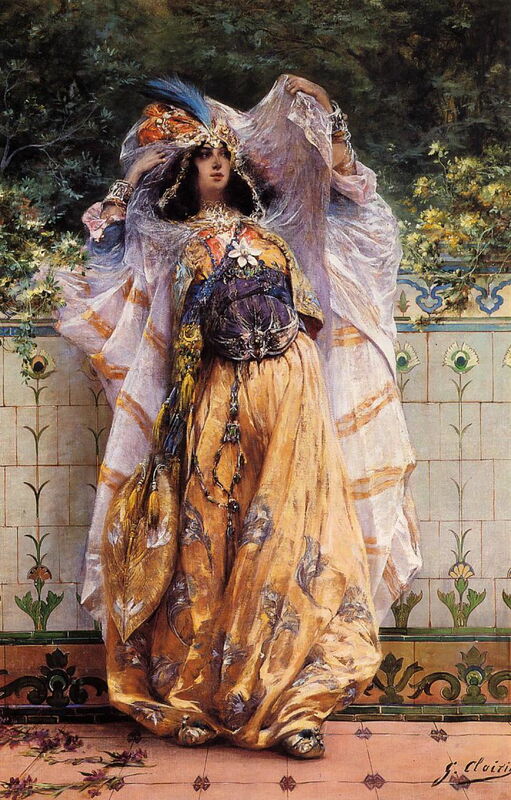 Sometime between about 1870 and 1876, Clairin met the aspiring young actress Sarah Bernhardt (1844-1923). They became good friends – so good that, when she was rich and successful, Bernhardt had a bungalow and studio built for Clairin on Belle-Île, where he spent his holidays, and much of his later years until his death just after the First World War. 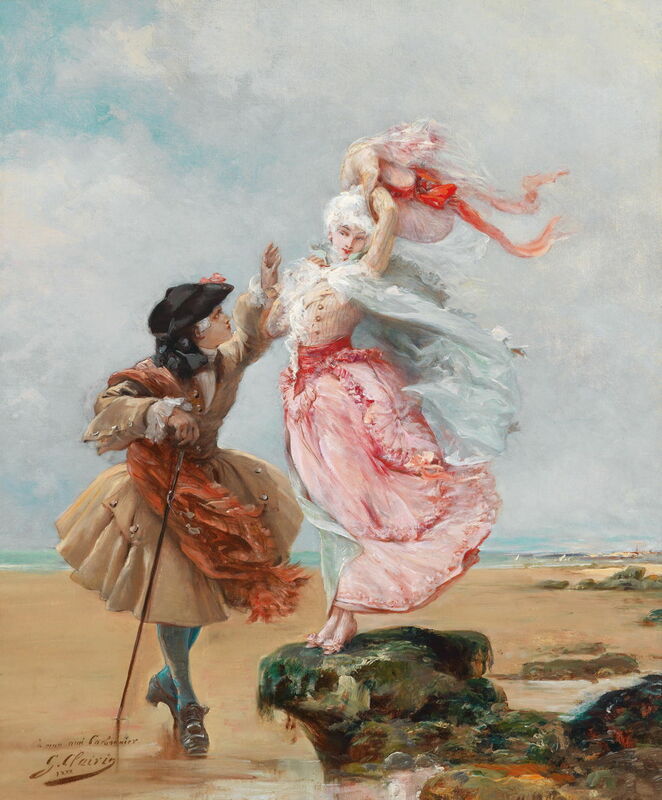 Georges Clairin (1843–1919), Frou-Frou (1882), oil on canvas, 241.3 × 141 cm, location not known. Wikimedia Commons. 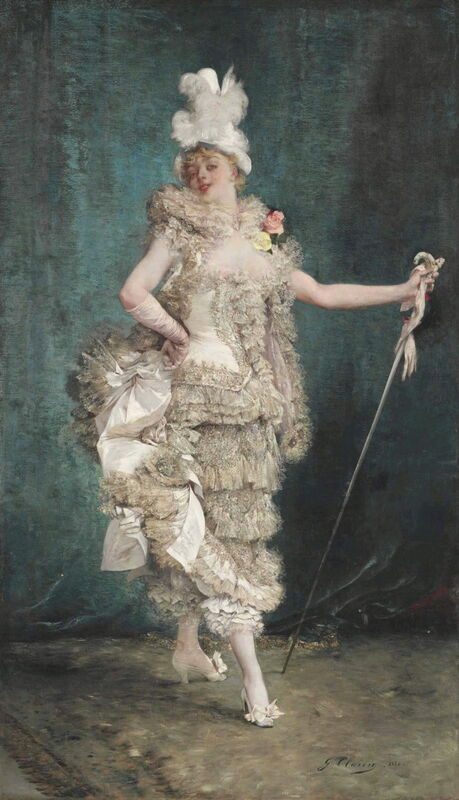 In 1882, Clairin painted Frou-Frou, the lead in a comedy based on a novel written by Henri Meilhac and Ludovic Halévy, and published in 1870. Although not a portrait of the actress, it is said to have been inspired by her interpretation of the role of Frou-Frou on stage. In the next article, I will look at Clairin’s portraits of his friend, and paintings of her made by others. Posted in General, Life, Painting and tagged Bernhardt, Clairin, Fortuny, Gérôme, painting, Regnault. Bookmark the permalink.